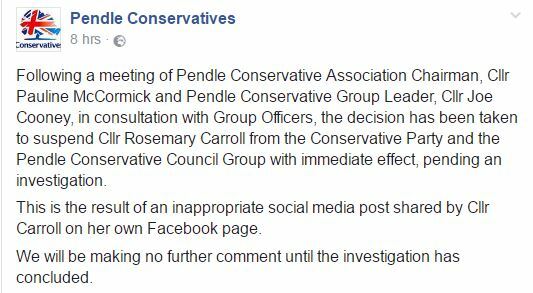 Conservative Councillor and former Mayor of Pendle, Rosemary Carroll, has brought the Conservative party to a new low after posting a tasteless joke on Facebook. The ‘joke’, needless to say, caused outrage. 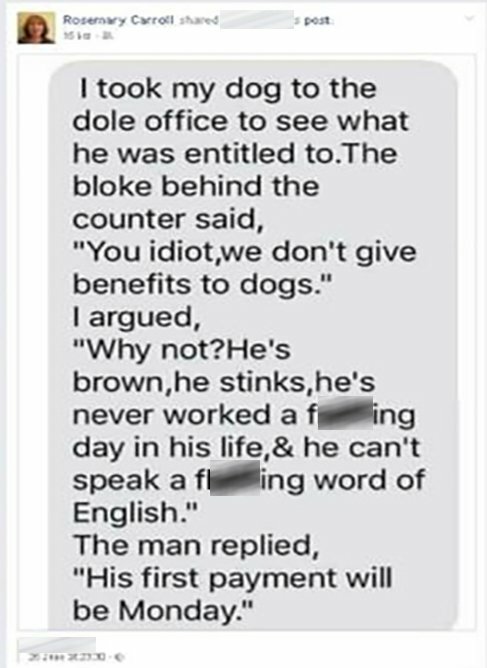 The Conservatives continue to show utter contempt for both people of colour as well as benefit claimants, as this crude post from one of their Councillors shows. Councillor Rosemary Carroll has been suspended from the party after the post appeared on her account earlier this week. It is disgraceful, but totally unsurprising, that somebody with these views could work their way up through the ranks to become a Tory Councillor, and even a Mayor. Carroll has now been listed as an Independent Councillor on the Pendle Borough Council website, but no one is under any illusions here. As much as the Tories may try their best to distance themselves from this bigot, the people of Britain are all too aware that this accurately reflects the nastiest parts of their party. Racism and classism are tumours on our society that must be cut out. One would hope that this disgraced councillor will do the honourable thing and step down completely, but honour is a rare trait among modern day fascists. If there is to be justice, it will likely only come when the people of Pendle have their next round of local elections, when, hopefully, they will cast this right-wing zealot out in the name of a better and more equal society.